California has more Salvadorans than any other state, and Newsom is in the country to learn more about why thousands are fleeing for the U.S.
California Gov. 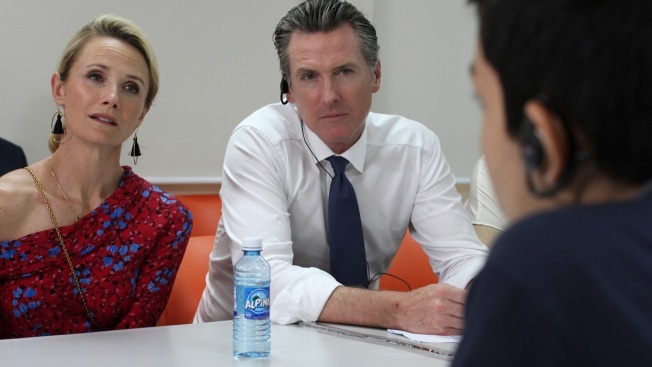 Gavin Newsom, and his wife, Jennifer Siebel Newsom hear the stories of three migrants who fled El Salvador due to violence and poverty and tried to reach the United States with last year's migrant caravans, during his visit to La Chacra Immigration Center in San Salvador, El Salvador, Monday, April 8, 2019. David Escobar Fuentes fled El Salvador because gangs were extorting his ranching family, while Bryon Melgar Menjivar wanted to escape the pressure to join a gang that started when he was 15. Sandra Monroy headed north for a good job. They told California Gov. Gavin Newsom their stories Monday, the second day of his visit to El Salvador. He met them at the country's only processing center for migrants who are deported from Mexico or the United States. It was his first opportunity to interact directly with people who have left the small Central American country because of poverty and violence. Later, he traveled to the small mountain town of Panchimalco to watch song and dance performances rooted in the mountain village's indigenous history. He then attended a stark conversation on human rights abuses against women and LGBT people. California has more Salvadorans than any other state, and Newsom is in the country to learn more about why thousands are fleeing for the U.S. About 3,000 unaccompanied Salvadoran children and 12,000 family members have entered the United States since October, according to U.S. Customs and Border Protection data. Fuentes and Monroy, his aunt, left for the U.S. in a caravan last October. "We were so excited because we were going to go to the United States — the wish all Salvadorans have," Monroy said. But they never made it. Authorities in Mexico stopped them, held them for three days and then bused them back to El Salvador. They did not share details about why they were stopped. Menjivar successfully made it to an aunt's home in Houston several years ago but returned home voluntarily when his mother needed help. He had crossed the border illegally with help from a human smuggler and hopes to return because of the violence at home. Violence by gangs has made El Salvador one of the most dangerous countries in the world, with 50 homicides for every 100,000 people. By contrast, the U.S. rate is about five per 100,000. "I never leave my house because it's so insecure outside," said Menjivar, who is 18. 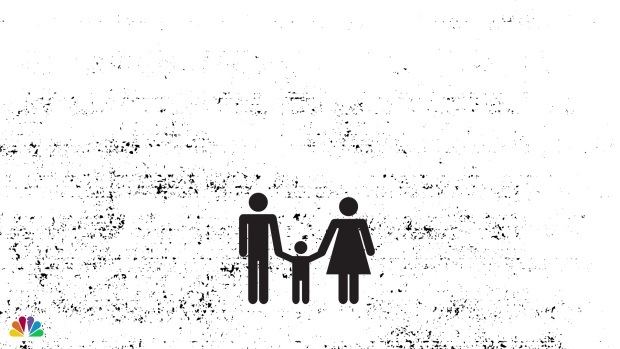 An overview of immigration in the U.S., by the numbers. The three met with Newsom privately after sharing their stories with reporters. The International Organization for Migration chose them to meet with the governor. Fuentes, 26, said his family used to own a farm with cattle and goats but was forced to sell many of them off as gangs demanded much of their profits. "Here, the struggle is day by day, you have to survive one day for the other," he said of El Salvador. President Donald Trump, who is shaking up his immigration leadership over frustration with a growing number of migrants at the southern border, has accused gang members of posing as migrants to enter the U.S. and bring violence. Monroy said some people in the caravans may be affiliated with gangs but most are trying to escape violence. Most Salvadorans at the reintegration center are sent back from Mexico, arriving on buses, said Salvador Gutierrez, deputy chief of mission for the International Organization for Migration. The U.S. also deports about three planes of up to 130 migrants per week, he said. Newsom was driven out of the city and up winding hills to Panchimalco, passing through rows of colorful but rundown houses, many made partly or entirely of metal. The village of about 35,000 is known for its robust cultural traditions and is home to one of the country's oldest churches. Gang activity is high on the outskirts of the town, and the village's vibrancy and violence were both on display as children performed in colorful clothes and played in a school yard while police held large guns in the streets. Newsom, alongside his wife Jennifer Siebel Newsom, watched young boys play flutes and couples dance in traditional clothing, including bright pink and red head scarves. The cultural center where the performances took place aims to teach children traditional crafting to help them build job skills, as many women make small amounts of money by sewing. Katherine Vasquez, a 17-year-old who performed in one of the dance groups, said that while violence surrounds Panchimalco she likes living there because of its cultural traditions. "I think he can help us to create new programs," Vasquez said of Newsom. "It's good he's visiting our village because he has an idea about the things that we can do." During the following round table on human rights, Panchimalco Mayor Mario Meléndez said women have few opportunities in El Salvador but the U.S. can help by investing in women and helping them become entrepreneurs. 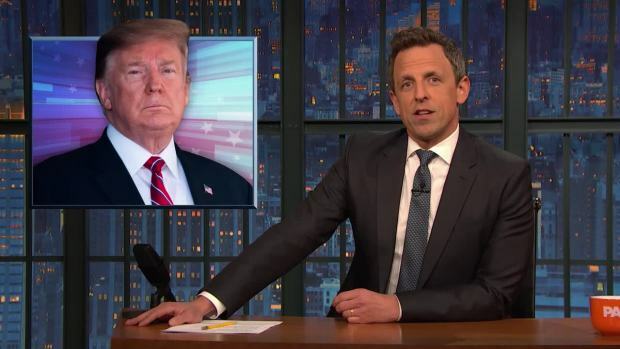 Seth Meyers takes a closer look at President Donald Trump's recent comments on immigration and his tax returns. "Men are usually the ones that take the money home, and if they take the money home, they have the power, so women feel threatened in their human rights," he said. Newsom said the day's conversations will allow him to present a further picture of El Salvador's challenges when he returns home. Earlier Monday, he met privately with President Salvador Sánchez Cerén and U.S. Ambassador Jean Manes. He shared limited details about the conversations, but said he's heard resounding disagreement to Trump's moves to cut foreign aid to El Salvador and other Central American nations. "Not one person that I've talked to says that it will do anything except make the migrant issues worse for the United States," he said.